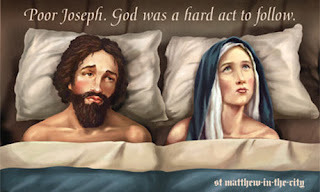 In an unorthodox take on the Christmas tale, the billboard depicts a forlorn Joseph and Mary looking to the sky with a caption which reads: "Poor Joseph. God is a hard act to follow." The St Matthew-in-the-City church said it wanted to inspire people to talk about the Christmas story. But within five hours of the billboard going up in downtown Auckland a man was standing on his car roof painting over the raunchy image. Archdeacon Glynn Cardy said the church meant to challenge a fundamentalist interpretation of Christ's birth. Cardy said one person had threatened to tear down the billboard but that of the 20 odd emails and phone calls he had received "about 50% said they loved it, and about 50% said it was terribly offensive". The Catholic church joined those on the attack, accusing the Anglican church of disrespect. "It's flying in the face of our 2,000-year-old beliefs," a Catholic church spokesman, Lyndsay Freer, said. The conservative Family First organisation said the Anglican church could debate the Bible story away from the public eye. "To confront children and families with the concept as a street billboard is completely irresponsible and unnecessary," Family First's national director, Bob McCoskrie, said. A complaint has been lodged with New Zealand's advertising watchdog, the Advertising Authority, but Cardy was unrepentant. "I don't see why one person's protest should deny other people the enjoyment of the billboard."